Doubting Thomas is an epithet too easily thrown about by those who live in the comfortable half light of unexamined certainty. Doubting is too often and too quickly interpreted as disloyalty, a lack of faith which implies lack of love. Following the resurrection, and after some had met and seen the risen Lord, Thomas seems to be the one asking the awkward questions, stubbornly refusing to be taken in by the stories told by others. Doubt is often dismissed as a spiritual fault, something to be guilty about; but some forms of doubt, including Thomas’s questions, are not guilty betrayal but struggling integrity. Perhaps Thomas wasn't playing the hard wired sceptic, nor the melancholic discourager of the others; a more pastoral view (which in the resurrection encounters is jesus consistent approach), might see him as one who needed encouraged but wouldn’t be patronised by platitudes and far-fetched stories. Perhaps his doubt and his earlier absence were not lack of loyalty but hurt love; a man disappointed because he hoped for so much. Sometimes it’s the person who believes most who hopes most, who takes disappointment hardest, and for whom faith is hard won. None of us would come to faith if we had no personal encounter with the Risen Lord, and were asked simply to rely on the say so of others. The story of Thomas meeting Jesus, the melting of his questions and hesitations before the personal reality and soul shattering truth of God in that invitation - "Touch my hands...put your hand in my side....don't be afraid". It is one of the most moving and pastorally intense encounters we have, and when John said there were plenty more stories he could tell, and even the world as a library couldn't contain them, he still included this one. In doing that he sanctified the deepest questions we can ask about God and ourselves. Whatever else Christian assurance is, it can never be the kind of certainty that forever disqualifies questions, or looks down on those for whom faith comes hard. Another Thomas, Thomas Merton, pointed out the dangers of superficial answers to those disturbing, persistent questions that are not the enemies of faith, but the living context within which faith affirms our trust in God, even if that means some questions are left unanswered. Indeed faith is nearest to the New Testament, when questions are asked, knowing that for now we see through a glass darkly. But questions cannot go unanswered unless they first be asked. And there is a far worse anxiety, a far worse insecurity, which comes from being afraid to ask the right questions – because they might turn out to have no answers. One of the moral diseases of the church comes from huddling together in the pale light of an insufficient answer to a question we are afraid to ask. The story of Thomas, his unsureness and his honest doubt, tells of the difference between a church huddling in the pale light of an insufficient answer, and a church emboldened by the one answer sufficient to all questions - the crucified, risen Lord in the midst. 'The Supper at Emmaus' by Caravaggio, had a profound effect upon me when I visited the National Gallery last summer during my sabbatical. It was one of those defining moments. While listening to a piece of music my emotions are quickly engaged, but up to this time, art hadn't effected me in the same way. It was while looking at this painting for a prolonged period that something changed. It was something to do with the centrality of the beardless Christ, the effect of darkness and light, the reaction of the disciples, the contrasting passivity of the servant, the sense that the fruit bowl is about to drop off the side of the table, the chair is being pushed back, the hole is about to develop in the elbow of the sleeve, the hand is coming out of the painting at you, and the way that I was invited into this action on the vacant side of the table. But it was more than all this. I think what did it was hearing a guide explain to a party, with what I conjecture was more than just an enthusiasm for the painting, that this is a freeze-frame, a split second before Jesus disappeared from their sight. I was profoundly moved. I can't explain it, except that the overall drama of the painting, paired with my love of the account of Jesus' appearance/disappearance, together with this interpretation, caused something to shift. The road to Emmaus is a wondrous part of the Easter story, and captured so effectively in the recent BBC production of 'The Passion'. What strikes me in the accounts of Jesus' resurrection appearances is how Jesus comes and goes at will, almost playfully, mischievously, 'now you see me, now you don't'. His presence can't be demanded, and he's only recognised when he chooses to be. The presence of the risen Jesus is not for us to grasp but for God to reveal. And this sets up a tension - there is a measure of innate insecurity in following Jesus. We rightly believe that God is with us, that God is for us, that God is actively involved in our lives, that God forgives us and hears our prayers. Jesus' last words were 'I am with you always'. We have the assurance of his loving presence. But from our side we have a tendency to treat God as if he has placed himself at our disposal, to do our will rather than the other way round. And maybe that's why there are seasons, when God seems to have disappeared, absented himself, hidden himself. We like to have everything sorted, certain, God-where-we-want-him, safe. But this isn't his way. As Mr Beaver reminds us in 'The Lion, the Witch and the Wardrobe', 'Aslan is not a tame Lion'. Two serendipities occurred at a similar time to experiencing the painting. The first was to read Sally Vickers, The Other Side of You. I've read all her novels and so I was really looking forward to reading this one, only to discover to my surprise and delight that Caravaggio's painting is central to the plot. 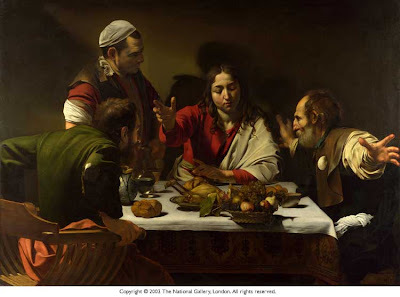 The second was to come across a poem by a favourite poet, Denise Levertov, inspired by a painting by Valasquez, 'The Servant-Girl at Emmaus. Probably I'd read it before, but again it came as a delightful surprise. While imagined, it is a beautiful, tender reflection on what could have taken place. Surely that face - ? The Johannine account of Palm Sunday includes Jesus speaking these famous words: "Unless an ear of wheat falls to the ground and dies, it remains only a single seed. But if it dies, it produces many seeds." (John 12:24 NIVi). At one level, this is a statement of the obvious, an agrarian image that speaks of the necessity of one part of season's harvest being set aside to ensure another one. And yet it is a powerful reminder of the costly sacrifice that has to be made - season after season - for a new harvest to be possible. Three years ago, my little congregation was forced to close a much loved chapel building. Since then, alongside a growing commitment to mission, we have worked long and hard to discern how best to handle its disposal. Finally, after two rounds of planning applications and lots of hard work by architects and advisers - to say nothing of the generous support of our Baptist Association who advanced us the cost of the all this work - during Holy Week we finally received the news that planning consent had been granted and we were now clear to sell the site for re-development. Part of the harvest of a byegone era was the Victorian chapel that has now died, that must be razed to the ground, in order that others may enjoy the land on which it was built, that this place may continue to serve the community ina way appropriate to its needs. The seeds from that season - both the people who have found faith and the money that will be realised from the sale - must now be sown for a new harvest in a new era. Death, yes, but new life, abundant life, also. "... seed fell on good soil. It came up and yielded a crop, a hundred times more than was sown." (Luke 8:8, NIVi) May it be so, Lord, may it be so.